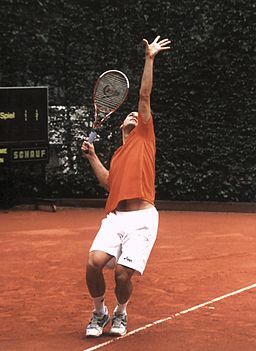 The one shot in tennis that you have 100% control over is the serve, and yet it's possibly the least practiced shot. How many times do club players warm up for a match and hit half a dozen serves then spin and start the match. Below are some practice serve tips. 1. Always practice the serve in quantity. The serve is based on coordination throughout, using all the body (feet, legs, hips, shoulders etc). 2. Create routines - bouncing of ball, focus, concentration and rhythm. 3. Serve at targets, split the service into two. Work at aiming to both sides. For more advanced practice, aim at a smaller target. 4. Work on a different pace for 1st and 2nd serve. 5. In doubles, communicate with your partner on direction. Tactical situations begin with the serve.